If you’re after a professional beauty salon on the Gold Coast where you can get eyelash extensions, call or come in and see Saskia at Saskia’s Nail and Beauty Bar. 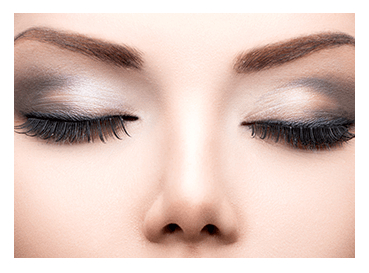 Long eyelashes can have a dramatic effect on the look of your eyes. Helping make them appear wider and more open and glamourous. Eyelash extensions will help you take your make-up routine to a new level. Beautiful lashes can allow you to reduce the amount of makeup you apply (no mascara necessary) and give you an all-round look of natural beauty. If you have short or few eyelashes naturally, we can help give you a comfortable and natural look that can increase your confidence and self-esteem. We apply synthetic silk or faux mink eyelash extensions to your natural lashes with a special semi-permanent bond to enhance your eyes. We apply each lash individually to allow your eyelids and eyelashes to move naturally and freely. This typically means that we will apply up to around 70 to 100 eyelashes per eye! The entire process generally takes between 1 and 2 hours. There’s no contact with your skin so you won’t feel any discomfort when getting eyelash extensions. 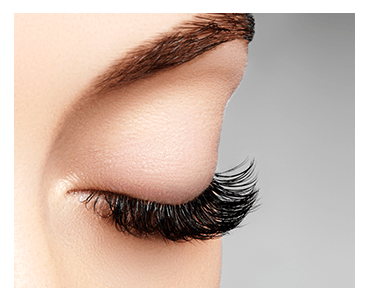 Your new eyelash extensions should last between 6 and 8 weeks. However it is advisable to have infills applied approximately every 2.5 to 3 weeks to make sure your eyelashes always look fabulous, as by this stage some would have fallen out as new lashes have grown through. How long your eyelash extensions last also depends on how you care for them, playing with or pulling out lashes, over brushing ( once a day is enough) rubbing or scratching your eyes, using oil based make up remover and getting the eyelash extensions wet before the allotted eight hours can dramatically shorten the life of your eyelashes. Book in for professionally applied eyelash extensions by calling us or dropping by our salon.